Standard - €123.99 Only 1 left! NOTE: The included A/C adapter may not be compatible for use in countries outside the U.S.
You know, they say that dogs think they are people and cats think they are gods. Well, if that’s true then this demonic looking puddy cat must think that it’s the overlord of the underworld. Just look at the ferocious look on this feline’s face, absolutely terrifying… and yet there is still something about this kitty that really makes us want to give it a good cuddle session. Hopefully your guests this Halloween don’t have the same temptations to pet this evil little guy. You never know when its devilish nature is going to be unleashed! 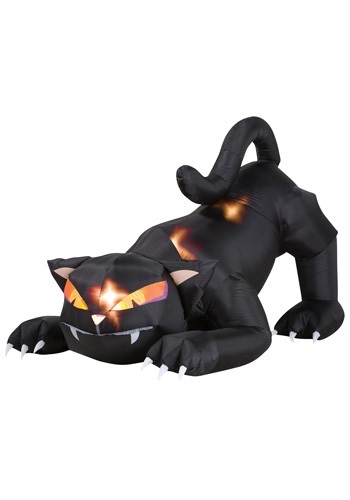 If you want to have the best-decorated house on the block this year then this Inflatable Cat with its moving head is the perfect addition to your haunted scene. Set up is simple, it inflates automatically after it's plugged in. Just make sure to warn all the trick or treaters about this beastly six-foot-long black cat, crossing its path at the wrong time could lead to a whole truckload of bad luck!